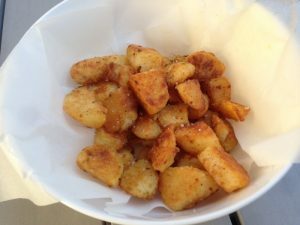 Next time you feel like eating chips, try making these fantastic, crunchy, roasted potatoes instead. They use less oil, they are faster and they taste so good. They are great as a snack with a beer, served as is, or with chipotle vegan mayo, or as a side to a meal, or even as a meal in their own right with a salad. And the best part is you can have them done in about 30 minutes. That’s less time than it will take to get to the takeaway shop and back, and they are infinitely yummier. The same principle applies if you are making them as larger roasted potatoes, but I like to make them bite sized. They cook faster that way too. I am indebted to my son for this recipe. I’ve never used the flour dusting technique that he uses. He was making them the other day when I was over for a visit and I devoured a few of them before heading home to make some for myself. Heat the oven to 220°C / 425°F. Put the olive oil into the roasting pan and place it into the oven. Peel the potatoes and cut them into pieces about 4cm across. Add the potatoes to some boiling water and cook for 5-7 minutes. The potatoes should not be completely cooked, they should be able to be pierced with a knife tip, but only just. Drain the potatoes into a sieve or colander. Sprinkle with the flour, paprika and salt and shake the sieve to coat the potatoes. As well as coating the potatoes, this will also rough up the outside so they will crisp up even more. Tip the potatoes into the hot pan, shake to coat them with the oil and cook for 20 minutes or until golden and crunchy, shaking the pan once or twice during cooking to make sure all the surfaces get some crunch. Drain on paper and sprinkle with salt. These look absolutely morish, can’t wait to try! Happy holidays! Made these tonight rosalie and had them with salad for dinner. Delicious and they looked delicious too. I used smoked paprika. Might had put too many in the own though as although they looked super crispy, they weren’t. That’s karma for being greedy!! !